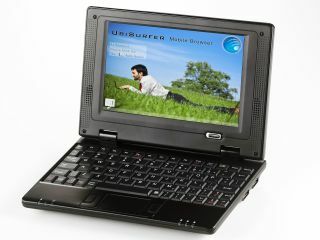 TechRadar and Datawind have teamed together to offer you the chance of winning one of four Ubisurfer netbooks. The UbiSurfer is the first netbook to offer users free Internet access in the UK and low cost roaming in Europe and USA, it also enables users to surf the web wherever there is a mobile phone signal. Connectivity is one of the UbiSurfer's strongest assets. Apart from the standard Wi-Fi and LAN connections, Datawind has collaborated with Vodafone to offer an embedded SIM and GPRS modem. This allows access to the internet anywhere a mobile phone signal is available, at home and abroad. Users are not limited to Wi-Fi hotspots and there is no need to buy a costly USB broadband dongle to ensure connection. Due to Datawind's patented acceleration technology the UbiSurfer delivers web pages faster than other portable netbooks on a mobile network, at five to seven seconds per page. Another feature that makes the UbiSurfer stand out from the competition is the free-usage model which eliminates the complexity of purchasing mobile web devices by eliminating lengthy contractual payments, activation fees and credit checks. With the UbiSurfer you pay for the device not the usage. For the average user, there are no monthly fees, airtime tariffs, contracts or recurring fees – those are paid for by Datawind. Users get 30 hours of free surfing a month for 12 months and 5p per minute roaming in Europe. Upgrading to an unlimited usage package is available, and only an additional £5.99 a month. This competition is now closed. The winners are Deborah Magee, Myrtle Rawlings, Les Clifton and Paul Sibley.